The links above also includes popular cultivars like ‘ice ballet’ (white), ‘Cinderella’, and ‘soul mate’. These have all been reported to attract monarchs too. Oddly, I couldn’t find “swamp milkweeed” in my Audobon wildflower guide. A pretty maueve-pink variety is growing in many of our streams here in upstate New York. A giant black swallowtail butterfly was on the one in our stream in late July. seems odd they wouldn’t have that one listed….yes, several swallowtail species are frequent visitors. enjoy! Mine is in full bloom and covered with lots of insects & butterflies! I saw strange hornets and looked them up, they are called baldfaced hornets! Love this plant! Year 3 with my incarnata. First 2 years, they were infested with aphids. This year, none. I’ll take it. Mine are lighter pink as was talked about in the comments. Sweet vanilla smell. Always tons of bees, Great Golden Digger wasps, hover flies (maybe that’s why no aphids this year?). And THIS year FINALLY, I have a couple Monarchs and a Great Spangled Fritillary. Wish I could post pics in here. I hope everyone is enjoying their milkweed! I just bought one at my local nursery. Zone 5. I have an herb/flower garden (95% herbs) for pollinators. It is off the patio so it is not a ‘wild’garden. Would it be unwise to plant the milkweed in the garden due to the pests/diseases it can get? Hi Laurie, any plant can have pests or diseases. If you plant several milkweed species and spread out patches, some will thrive without pests or disease issues while some will have more problems. Gardening is a continuous experiment. We plant some in containers, but most is planted in the yard/garden. I have a few A. incarnata plants, but one of them has flowers and buds that are a much lighter shade of pink than the others. Are there any reasons why it could be like that? Hello, Tony – I purchased and planted 4 asclepias incarnata late last summer, but they didn’t survive winter. The bed in which they’re planted is heavily mulched and, since we’re in the Nashville area and don’t experience harsh winters, I didn’t lay extra mulch last fall. Last week, I purchased 6 new asclepias incarnata from the same garden center. The plants had been forgotten and were being stored in the back of one of their greenhouses, but they had been watered and were receiving filtered light. They are approx 36″ tall, very leggy, the lower leaves have turned yellow and are falling off… they really look quite pitiful. I doubt they will flower this year, so I’m wondering if it would be wise to cut the plants back and give them a chance to get healthier. I probably shouldn’t have purchased the plants, I just felt sorry for them and hoped I could get them healthy again! Please advise, thank you! Thanks, Tony, to what point would you suggest I cut back the plants? hi, I read its best to plant swamp milkweed in clusters of six. Six means what? six plants or six stems? Also, I have a deep pot I wanted to place them in since there’s no room in our hummingbird garden. the pot is about 2.5 feet by 2 .5 feet. However, the guy at the nursery scared me about potted plants dying in the winter. I am in Zone 6 and the milkweed is zone 3 with a deep pot. Am I really taking a risk it won’t survive the winter by placing it into a pot? Besides moving it indoors how can I ensure a winter survival? Also, how good is the ice ballet for hummingbirds and butterflies? any idea? Our new swamp milkweed plants are growing nice and tall in our garden. This evening, I snapped off a damaged-looking leaf from one of the plants and sap came seeping out. At the sap point, the stem looked a bit bent. Maybe I’m over-obsessing, but do you think I damaged the stem? I sure hope not! Hello. I have a Butterfly Garden in Orlando, Florida. The Nurseries here sell a lot of Tropical Milkweed (A. Curassavica) which is not native to Florida. I recently read an article about a UF study that possibly connects Tropical Milkweed to a deadly parasite that affects Monarchs. The study said the Monarchs hatch with deformed wings. Do you know anything about this? Last season, I did hatch some Monarchs with crumpled wings. Now, that I know the possible reason why…I want to get rid of all my Tropical Milkweed! I just bought six swamp milkweed plants. I actually have a wetland behind my house here in North Carolina. Since swamp milkweed “likes it wet”, should I plant it where there’s always mud? Is that too wet? I have plenty of places around my house to plant it, but if it would rather be down in the swamp….I can certainly put it where it wants to be. Any suggestions? Hi David, I’ve seen it growing through water before, so mud shouldn’t be an issue. You could also experiment with 2 mini-patches in different growing conditions. Swamp milkweed seeds a lot so you will be able to expand in the coming seasons…good luck! I have about 20 plants that are all volunteers. We’ve had a frost here in Missouri, so the plants are finished. I had to cut off the seed pods several weeks ago because they had lots of milkweed bugs, thus I don’t know how many seeds may have dropped. If I want the milkweeds again next year, do I cut the plants back or pull them out and depend on random seed droppings? Is there a way to avoid the bugs? They were really yucky. Now do I cut the old plants back or pull them out for the winter? Hi Debbi, you can cut back incarnata to the ground in fall or spring. Don’t pull it out, or you’ll pull out the roots. I live in Denver, CO and while we aren’t really on the migration path I’ve read we can get a few monarchs- other pollinators would benefit even if no monarchs. I’d like to plant swamp milkweed and wondering about planting the seeds outside- if winter is cold enough. I’m in hardiness zone 5a. Otherwise I’ll do the refrigerator! Thanks! Hi Linda, you winter weather should provide the perfect ‘natural’ cold moist stratification for your swamp seeds…happy planting. Thank you! This site is so amazingly full of information, I love it! It took me a long time to find where I had posted again, didn’t bookmark ugh. I found a supplier of seeds within 5 miles of me on eBay and ordered some. Have them cold stratifying in the fridge for my first try- next time will winter sow them. Hoping for at least one monarch…anxiously awaiting summer. I live in Southern Oregon. Will the swamp milkweed survive the winter or is it definitely an annual in Oregon? Oh thank goodness. We love the swamp milkweed. Thx for the good news. So many conflicting reports to its hardiness. Hi — I have lots of common milkweed in my VT pastures, and this year noticed a surprising number of Monarch butterflies. I accidentally found a chrysalis in the barn, which I brought indoors; and, before I realized there were many caterpillars in the fields, I brought one caterpillar that I found indoors as well. I was delighted when these both successfully matured to butterflies (first attempt at rearing). 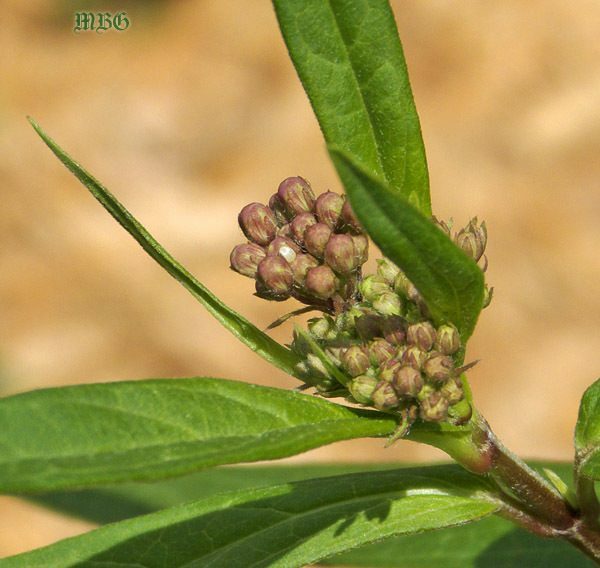 I’d like to plant Asclepias incarnata in some swampy areas of my property. If I buy dry seed at this time of year, can I store it dry overwinter in the refrigerator, to be wet-stratified closer to planting time in the spring? My swamp milkweed is going to seed. They are about 4 ft. high with many small new plants growing along side them that have not flowered. Is it best to cut back the large stalks to the ground and pull out the young plants so they don’t overrun the planting area or should I leave a few of the small plants and then just cut them to the ground also? Hi Marilyn, you can cut back swamp milkweed stalks to the ground in fall or spring. If you have plants that are growing in a place that will cause crowding, I would pull and discard or transplant. Tony, I do have phytoplasma, and now I’m contending with reddish brown spots on the edges of the leaves. Should I just dig up the whole plant and destroy it, or just cut the plant back to the ground? Also, is there a difference between milkweed bugs and assassin bugs? I think I have the latter each summer, because I still get good seed pods, and they eat the aphids, so should I leave well enough alone? Hi Kris, we’ve had what I believe was phytoplasma on our common milkweed in the past and I just cut it back…the next year it didn’t come back. Personally, I would cut it back and see if that makes a difference. If the problem persists, then I would pull it. I have nice swamp milkweed growing but leaves covered with aphids!! I’m afraid to take them off ( I usually just squash them on the leaf) for fear I’ll get a Monarch egg. Will the monarch still lay on the leaf if the aphids are there? Love this web sight. Thank you so much for doing it. I have one A. Incarnata growing that suddenly started pushing out “sucker” stems, stems growing out from established leaf stems, and have the top most portion looking odd. They are bright green with hues of yellow (but not yellow leaves), kind of limp and gangly, curling inward, and the flower pods in them are very tiny. The leaves at the top of the plant are all like this, though the ones in the bottom half are normal. Could this be because of the type of bloom-booster fertilizer I gave it? This is what I suspect. I went and cut of the strange leaves, and pinched off the suckers underneath, but will I now not get flowers since I cut off the tops? Yes. And now I’m noticing reddish-brown spots forming along the edges of the healthy leaves. I think I may need to chop this back, but these spots are also affecting the stems down to the root ball. Should I just dig it up so it doesn’t spread to my other two healthy and beautiful swamp milkweeds nearby? One more questions: In late summer, I get overrun by the assassin bugs. They eat the aphids, but they also lay gobs of eggs on the plant creating a creepy bug kingdom in the fall, lol. They look like the milkweed bug, but my plants never seem worse for the wear, and I get loads of seed pods. They aren’t the same bug are they? If so, how can I treat my plants this year? Hi Kris, Assassin bugs are caterpillar predators, while milkweed bugs feast on the seeds. Both can be problematic in large numbers. I would remove/discard their eggs to prevent the issue…study images closely so you know what they look like and don’t remove beneficial eggs, like the lady bugs. I live in Bowie, MD (near Annapolis, MD). Recently bought Swamp Milkweed (Asclepias Incarnata), 2 ft tall and Butterfly Flower (Asclepias Tuberosa), 1 ft tall from local nursery. Any recommendations on planting them in pots? Regular potting soil? Fertilizer? Other tips? Thank you. Do swamp milkweed have a pink stalk? Where I had planted a pink swamp milkweed last year the stalk is pink. I’m trying to find some wild milkweed & appear to be finding a lot of dogvane–but have seen some milkweed out & about with pink stalks, so? The monarchs flew in with a bunch of eggs over the last couple of weeks which we don’t normally see here from what I’ve heard. I’ve taken in some eggs but am looking at soon feeding squash if I don’t find an alternative. Nancy, I don’t know where in Alabama you live, but The Greenery in Brownsboro (Huntsville) sold me some milkweed a couple weeks ago that they had raised (with no pesticides). And those plants I purchased are doing great! I also have some milkweed I saved from the side of the road that was next in line to be bush hogged. I’d be willing to share a few stalks if you need them. I too was desperate about 2 weeks ago and since my cats were older, I tried butternut squash and zuchinni. They LOVED it! I am expecting butterflies any day now! Good luck. I live in north central Texas. Have very hot summers. I have ask several nurserys about milkweed and always get negative comments. These are nurserys who sell native plants. What type of milkweed grows best here? And a source for them. Love this site. Thanks for advise. Hi, I lived in the DFW area for over 30 years before moving to Huntsville (70 miles north of Houston). I didn’t get into butterfly gardening until I moved here in 2013. I have orange butterfly weed that I started from seed last year. It has been short, but is blooming well. I started my plants from Burpee seeds purchased at a small, local garden center. I currently have Milkmaid growing which was purchased from Swallowtail garden seeds. I will set it out either later this fall or early next spring (protecting from frosts during the winter). Check out High Country Gardens and Swallowtail Garden Seeds. Swallowtail will answer all of your questions. Milkmaid thrives in moist, wet soil, but can adapt to drier conditions. I have had the best luck using the milk jug winter sowing method. If I want to start seeds in the summer, I leave the jug on my south facing back porch, plenty of light, but not the brutal sun. Interestingly enough, it has been very humid here this summer, and the Milkmaid germinated quickly and is looking great. You just have to keep plugging away at it. Nurseries in the DFW area sell what the general public wants. Everybody has the same old stuff in their yards. butterfly gardens can get ratty looking because you can’t use chemicals. Wild flowers are sort of hard to get started, but once you get them going, they are pretty tough. I have even managed to germinate stands of Blue Bonnets. It can be done! Good Luck!! 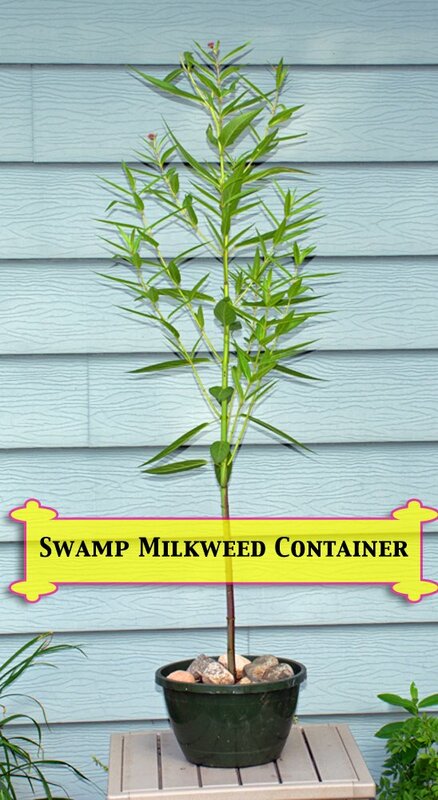 I live in Eastern North Carolina – swamp land / brackish water surrounds our property will swamp milkweed grow well here? Very hot and humid in summer, mostly mild winters although some days below freezing temperatures. Hi Diann, it is native to your region. From what you’re describing, it sounds like a good option for you to consider planting…good luck! Why aren’t my swamp milkweed plants blooming? The tropical milkweed and butterfly weed have bloomed and are producing seed pods. I have treated the oleander aphids with soapy water. I still have monarch caterpillars but no blooms or seed pods on the swamp milkweed..
Hi Jan, if you started from seed this year, that’s one potential reason. Otherwise, swamp milkweed doesn’t grow well in warm regions and I’ve heard similar complaints (no blooms) from other gardeners. It blooms prolifically in our northern region. Hi, first time planter of swamp milkweed. Bought the plant at a garden center. I would like to know if I should cut it down in the fall? I live in Quebec,Canada. Hi Janice, it will die back to the ground. You can cut it back in fall or spring. This year I planted both swamp and common milkweed from seeds (winter sown) and both are doing great in my garden so far (zone 6b). This is my first try with milkweed, is there any chance that they will bloom? I’m also wondering if butterflies will find it, even without blooms, to lay their eggs. I have buddleja, bee balm, cone flowers, and other blooms for nectar. Thanks!! Hi Maryanne, congrats on your new garden. Common won’t flower the first season and swamp probably won’t although you might see some blooms late season. Your nectar plant selections all sound good. Sometimes it can take a while for monarchs to find you, but once they do they continue to come back. While you’re waiting, continue to work on improving your garden…good luck! I live in upstate NY the FingerLakes area, I would like to put in a large area of milkweed. I have a 100 acres that I manage organically for my bees and and other wild life. I would like to expand on my milkweed area, I have quite a bit of common milkweed seed and a small amount of swamp seed. Was wondering if you knew what kind of soil preperation is needed and what is the best way to plant the seed? I have quite a bit of self seeded milkweed, but I am not sure what is the best way to plant in a large area. Love your site and all the wonderful info, have passed your site on to a number of people. The lower leaves of my swamp milkweed plants are turning yellow More and more each day. I thought I would add fertilizer so I gently moved the mulch to add the fertilizer to the soil. Directly beneath the mulch I could see the roots of the plant. I believe the rains washed away the soil. Do you think the somewhat exposed roots would cause the plant leaves to turn yellow. I am thinking of adding more soil and hopefully the roots will remain buried and the plant health will improve. Do you have any other suggestions?? My swamp milkweed did the same thing this year (its second year). The lower leaves all turned yellow and dropped off. Then the flower clusters (almost ready to open) wilted and the next morning looked as though something had snapped them off. Only hanging onto the stalk by a thread, but leaves are still green. This has happened to each blossom cluster, one by one, until I have only one left. I’m hoping it will bloom. I acquired a swamp milkweed last year. When the flower blossoms started the ends of the stalks looked pinched and the drooped and died.This year it’s happening when the stalks are only 6 inches tall.What can I do? I live in Indiana. Hi Terry, this is not an issue I’ve come across. Incarnata likes moist soil…are your plants getting adequate rain/watering? Our swamp patch has thrived in partial shade in Minnesota. This is happening to my swamp milkweed, too. I’m in central Kentucky and we have gotten much more rain than average this Spring, so the plants are certainly getting enough water. They started off great in April but soon seemed to stop growing and then wilting. Hi Jessica, have you tried mixing compost into the soil or fertilizing the plants with a slow release fertilizer? Is it possible there is a small pest causing the damage like spider mites? Are your plants in full sun? We live in the mountains of British Columbia, at 1400 M, and were told that Swamp Milkweed does not grow at this alttittu; however, we proved the experts wrong. I must admit that for the first two years the plants didn’t do much, but in the third year, they really did their thing. From the original three plants a d five years after the first planting of three, we now have thirteen plants. We have two shrub trees that have grown enough to shade the milkweeds from the direct sun so that must have been nature’s answer to growing Swamp Milkweed. We even had two monarchs pay us a visit last year. Hi, When you tell people where they can purchase milkweed, have you checked out these places to make sure the do not use neonics and other systemic pesticides that are killing the butterflies and harming the bees? Our swamp milkweed in our prairie garden is a butterfly magnet! I have raised many Monarchs from that one plant in my classroom to my first graders delight. It is always a treat to go to the garden to count the number of pollinators seen on it. I would add giant swallowtail to your list that asclepias incarnata attracts. We consider ourselves lucky – last year a prairie milkweed grew out of the seedbed of our prairie bed. I can’t wait for it to mature and flower to see what pollinators show up ! good luck with your sulivantii plant! Hi Lauri, those plants come back from the roots. We cut back the dead stalks of incarnata in the spring and dead stems of syriaca can be pulled from the ground. If they don’t pull out easy (they shouldn’t be attached to the root system) then just cut them back. With the early spring, you should probably see milkweed shoots popping up from the ground in April. Good luck! I live in Los Angeles and just bought 100 packs of ‘Swamp Milkweed” seeds from Save our Monarchs. Will they grow here? I have found contradicting opinions all over the web. We are a mile from the beach, but not really a “swamp”. What do you think? I’m planning on starting new Milkweed this fall,after the ground freezes,Going to put them in pots so I’ll have them growing nicely for our garden club plant sale in the spring . Do you think if I plant them in pots and put the pots half way in the soil under the sun deck that they would be OK ? Released my last Monarch midweek,do you think he will make it to Mexico before the hard freeze ? Hi Judy, you can try it and see if it works. You can also try winter sowing with a mass of seeds and then separate the seedlings in spring. It’s always good to try a couple different propagation techniques in case one doesn’t work out for some reason. 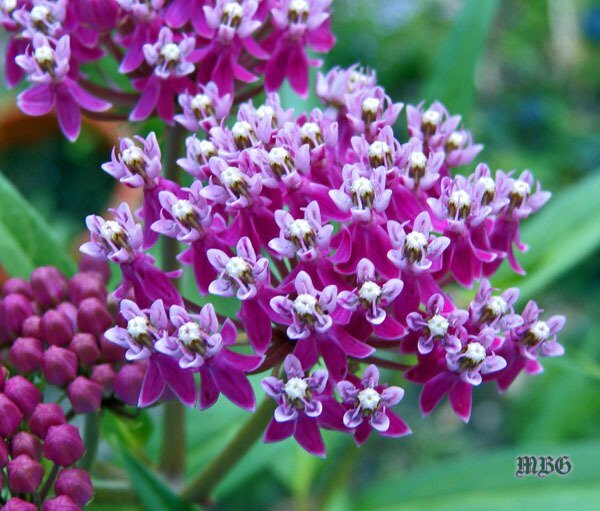 I planted three swamp milkweed plants in the early Spring and each had clusters of flowers. Now I must have a total of at least 30 long narrow seed pods! What do I do, just leave them fall to the ground; pluck some off to give to a friend??? I have other plants/flowers in the same smallish area so I am not interested in turning the whole space into a butterfly garden. Thank you. Hi Dennis, if you don’t want them to seed, but would like to share them with friends, try tying bags around the pods. You can get them on this gift idea post or find some locally. We live on the east coast of Florida, Zone 9b. I just bought an asclepias perennis at a native plant nursery on Sanibel Island – which is on the east coast. The plant tag says it will thrive down to Zone 8b, so I was wondering if I should give it more shade – the tag says full to part sun – should I plant it in part sun rather than giving it more than that, since we are one zone further south? Thank you – what a great website you have. Hi Meredydd, I have not grown A.perennis before, but since it likes moist soil conditions I would definitely try some in partial shade. You might try planting in two different growing conditions and see which it prefers. Then, you can transfer all plants to the best area. good luck! My milkweed is in its third season and the blossoms are enjoyed by lots of pollinators. Monarch’s frequent the plants (four large clumps, mixed in with other butterfly plants, spanning 20 feet) but do not seem to lay their eggs on the plants. Instead, they lay their eggs on Butterfly Weed and we’ve had lots of cats devouring them to nubs. I’ve read that Butterfly Weed is a Monarch’s second choice for laying eggs. Do you have any idea what could be wrong with my milkweed? We’ve had eggs and caterpillars on them in years past. Thanks. I want to plant the pink swamp milkweed in containers for the balcony. What is the best materials to use? Planter – ceramic, taracota or plastic? Soil- regular potting mix or triple mix? Stones – required? Bottom, through out or top? I just purchased 4 plants in plastic containers in 1 gallon pots. I am already noticing very small caterpillars who are eating the leaves of my plants. My worry is 3 of the plants have several yellow leaves and its growing up my plant. I have only had these plants for 2 days, I am getting worried. I live in southern CA and its been pretty hot. 85 degrees lately. I currently have them under my patio awning made of wood. The soil seems a little damp but not wet. What can I do to stop my leaves turning yellow? I have Blood flower silky golds & red butterfly weed. Help!!! Our swamp milkweed bloomed beautifully it’s second year here in NJ. Last year we deadheaded tuberosa and it rebloomed. Can we do the same with incarnata? If so, I might need a stepladder! Thanks. I have dug up some swamp milkweed from a near by ditch (mowers will get it otherwise). How do I transplant it to my garden? Right now it’s sitting in a bucket of water. Hi Lindsay, swamp milkweed is pretty easy to transplant because it has no taproot. In perfect circumstances you would do this at the beginning or end of the season. I would transplant as quickly as possible, and make sure the soil stays most while the plants acclimate to their new surroundings. If you were going to try a transplant mid season, swamp probably has the best chance of survival…good luck! I live in Richmond, VA and I planted 5 swamp milkweed plants last year. I am beginning to think I planted them too close together because this year they came back much larger than they were last year with more stems coming out of the ground. (Should I cut some of the main stems off?) The soil this year has been wet due to rain. The leaves (esp. bottom ones) turn yellow – I pick these off – some of them have spots on the back. The top leaves are in great shape so far but the plants are very crowded because they are so huge. I also have two new plants whose leaves are not turning yellow. I’d like to propagate some plants from cuttings just in case I need more plants. How do I do that? I have a “bog filter” where water from my koi pond is biologically cleaned and have had some kind of milkweed there for years. The bog filter is a bed of gravel over a rubber liner and is constantly saturated with water. Having seen a monarch at the plant today, I did some research and it is likely A. incarnata. It must be over 4 years old. It mixes well with the water irises and pickerel weed and being 4 feet tall always stands well above them to get plenty of light. I planted Butterfly Weed, asclepias incarnata ‘Soulmate’, in my backyard where my dogs will be around it. Do I need to move it? Is it poisonous for them? Hi Diann, it’s potentially poisonous if they consumed a large quantity of it, but most pets won’t touch milkweed as it has a bitter taste. Our dogs have never even nibbled on milkweed and we grow it all over our yard. The only reason I would consider moving is if your dogs have a history of eating garden plants. Thank you. They sniff around it but that is all. I’ll leave it alone. I have a North side area that gets around 6 hours of sunshine and can get very wet when it rains. I live in North Texas. Will swamp milkweed thrive in this area? Dill plant is growing very well. Hi Yvette, those sound like prime conditions for growing swamp milkweed…good luck! How can I safely separate our swamp milkweed so I can plant it all over my yard? We get plenty of sun and water, so it should be the perfect conditions for it to thrive. Right now, there are about 20 stalks on our plant. If breaking them up and spreading them out is gonna threaten its survival, I’ll just keep it together as it is. But I’m hoping I can spread it out & COVER my backyard with it. Kudos to Tony and all ye excellent Monarch supporters!! I’ve been raising monarchs for over ten years…I recently bought swamp milkweed and am wondering if it will grow well and survive a New Jersey winter if I plant it in pots rather than in the ground. A friend told me it would not flower in a pot and that it would not survive the cold of winter. Please advise. Hi Barbara, swamp milkweed will bloom in containers if it’s a second year plant or older. We don’t overwinter swamp in pots, we leave a few seedlings in undesirable places, and then pot them up when they return next spring. You can also keep them in pots. I would advise putting containers in a protected area or wrapping the pots to keep soil temps warmer until spring. If I can take a cutting, can I use the tropical milkweed instructions? Hi Kat, division works well for swamp milkweed. Swamp does not root in water like tropical…good luck! I have swamp growing from rhizomes. So if I read these posts correctly, seeds do better in pots and rhizomes do better in the ground. last year we had no luck with the seeds, but this year I bought a rhizome and it just took off. Hi Tammy, swamp milkweed doesn’t have rhizomes…just a regular root system. This makes it an easy milkweed to transplant in your garden or in containers. You can try growing any variety of milkweed in containers. If the variety spreads through rhizomes, you’ll want a bigger pot to accommodate them. I like the purplish color of the Swamp Milkweed shown in these pictures. Where can I get seeds that will produce this color of plant? Also, I’m in upstate NY and my Asclepias Tuberosa dies out here in the winter. Other people write as though it lives through the winter. Am I missing something? I grew tuberosa in Santa Monica CA and it lived through winters, along with Monarchs that graced my garden year-round. I’ve been trying to find out which Ascelpias species will live through the winters in upstate NY. Any advice would be appreciated. Thanks! I am growing a butterfly garden for a few years now. Last year I planted swamp milkweed asclepias incarnata. I have saved lots of seeds and also threw lots of seeds back in the garden. I am new to this. I want to buy more milkweed different varieties annd plant but no one seems to carry it on Long Island. So where can I buy it? Also what varieties? Last year had lots of problems with aphids . I cut down plants to ground. Will they grow again? Swamp milkweed is pretty resilient so I would be hopeful it will come back this season, even after cutting it back. Good luck! I saw a mention on another list of features of swamp milkweed that it could grow in a swamp or pond. Do you know if we could actually grow it submerged in a pot in a pond with a plastic liner, no swamp or wetland type edge. Full or maybe filtered late afternoon shade, depending on where we put it. We’re adding more local milkweeds in sunny ground areas, and I love the idea of some pretty pink ones in the pond. Hi Sheila, I haven’t personally grown it in water, but it’s in a section of our yard where there is often standing water after snow melt and after heavy rain. I’ve also seen it growing right next to lakes/ponds where I’m certain it must be submerged during wetter periods. I would try a few and see what happens…please keep us posted! 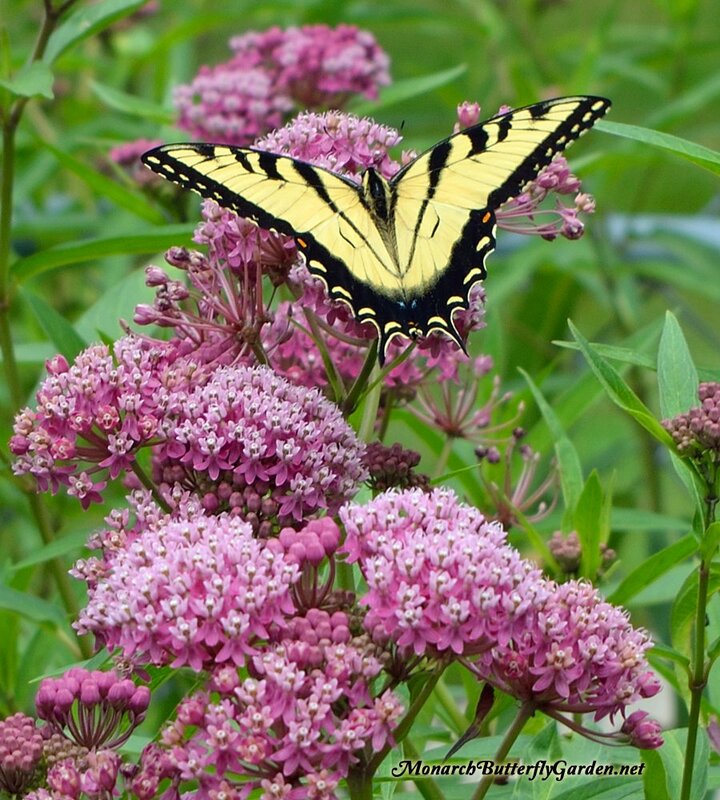 We have been butterfly gardening for a few years now, and I just read that swamp milkweed has an average lifespan of 3 to 5 years. We haven’t lost any of our plants yet, but this will be the fourth year for our original swamp milkweed and I wonder if I should start a few new plants from seed this spring just in case we start losing our original plants in the next year or so? Have you had to replace any of your swamp milkweed, or have your plants lived longer than the average 3 to 5 year life expectancy. I’m so glad I found this website. This is my second year raising butterflies and have found this site very informative. I have the perfect moist spot for swamp milkweed. now that I know – that will be my new project. I have a large area of common milk weed and hoped to harvest the seed but have lost most to aphids and beetles. Other than hand clean the pods what else could I be doing to save more seed? Black birds do a wonderful job of cleaning when they come in a flock , but you know how they are–here today, gone tomorrow. Hi Charlene, I’m happy to hear you have taken up the hobby of raising monarchs…a fun and rewarding experience. Aphids and beetles can be pests, but I usually try to combat pests by diversifying milkweed varieties and putting several patches throughout the yard and garden. If you feel you need to remove beetles, you could always flick them in a bucket of soapy water, which works well for Japanese beetles. Otherwise, I think birds eat them too. Here are 7 ways to get rid of aphids…good luck! In Wisconsin we have a place called Prairie Nursery .I bought five plants last summer and planted them by our down spouts to give them extra water. This year I had more insect activity than ever. I’ve had Butterfly Weed for years and have not had much luck attracting Monarchs .That all changed with the Swamp Milkweeds. 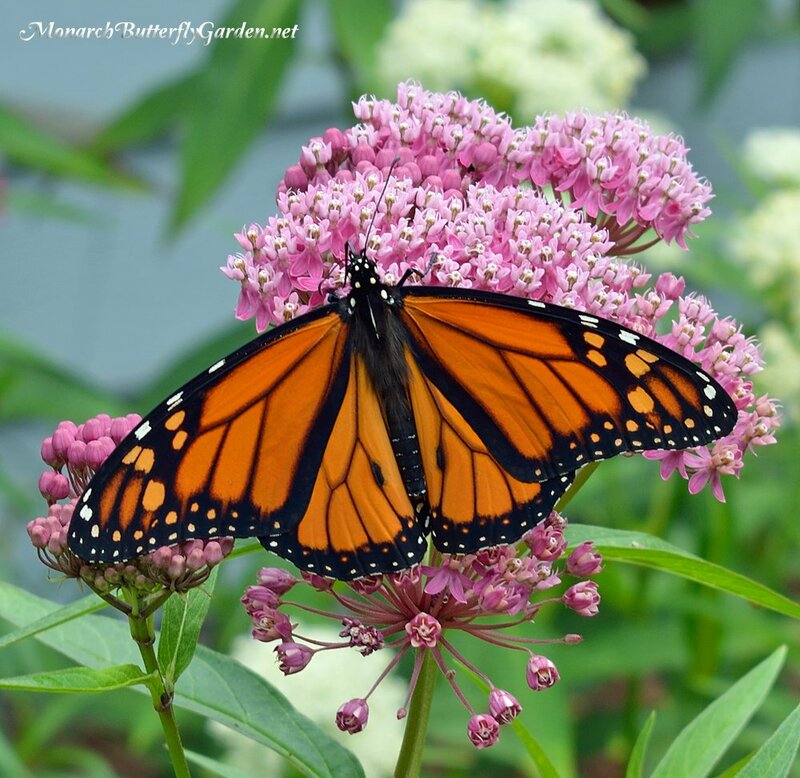 Hi Mike, glad to hear adding more varieties of milkweed brought more monarchs to your garden. This was a banner year for swamp with cooler temps and more rain in the upper midwest. You’ll find that “favorite” milkweeds change from year to year depending on the weather patterns. There were also more monarchs this season too…I hope this trend continues going forward. Congrats on your swamp success! I have a few plants of incarnata growing in partial shade and dry sandy soil on the New Jersey shore. It is doing very well, but the blooms do not last very long. We had monarch butterflies, eggs, and caterpillars this year. I just harvested twelve ounces of seeds from 6-8 plants. I also have many tuberosa plants nearby. The blooms last longer and it reblooms more readily when pinched back. Hi Mary, the short bloom period is likely the result of growing in dry, sandy soil. Swamp milkweed likes it wet. Congrats on all your eggs and caterpillars this season, and on your bountiful harvest! I live in the Atlanta area and planted asclepias incarnata in my garden about 5 years ago, right next to my asclepias tuberosa. The tuberosa blooms prolifically– the incarnata has never bloomed. Is it because the site is too dry? Incarnata typically blooms its second year. We grow ours in partial shade and this allows the soil to retain more moisture. If it’s planted in a dry area of your garden, I would try moving it…you’ve got nothing to lose if it hasn’t bloomed for 5 years. Good luck!